Our experience travelling around Ba Be National Park in Northern Vietnam. The flames dancing between the rim of the steel stove threw striking shadows across the room. Loan, our evening’s host, leaned into the steam riding from the pot and carefully poured in a plate of freshly picked morning glorym which only moments ago had still be growing in her outside garden. After trekking 10km through isolated villages in Ba Be National Park, we had worked up a ravenous appetite. Seated on wooden stools only slightly higher than our shoes, we sipped on green tea, waiting for our dinner to be prepared. The scent of frying garlic and green vegetables wafted through the open kitchen and prodded our hungriness to almost unbearable levels. Loan’s husband, Hung, sensed our excitement for the upcoming meal. He broke our train of thought by passing shot glasses full of home-brewed corn wine – a moonshine fondly dubbed “happy water” in English. Acknowledging his kind offer, clinked our glasses together and cheered to good health. Wincing as we downed the liquor, we knew it would not be the last one of the night. Don’t miss out on our new guide to help you Travel To Vietnam. Warming up by the open fire high up in Ba Be National Park. 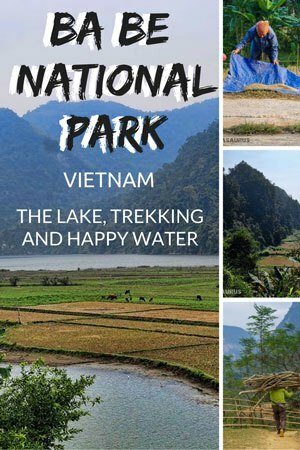 We did not know what to expect when our new friend Mr Linh told us he had a two day, 30km trek planned for us in the ruggedly beautiful Ba Be National Park. We had arrived at his luxurious homestay with the idea of relaxing in lakeside hammocks, recharging our batteries after our motorcycle loop around Northern Vietnam. But Mr Linh had other plans for us. He wanted us to experience the best the national park had to offer. The relaxing would come later. On our first morning in Ba Be National Park we set off from Mr Linh’s Homestay for a boat tour around the world’s only permanent freshwater Karst lake. As we cruised the calm inland sea we absorbed ourselves in the stark limestone cliffs and dense forest fringing the edges of the lake. After a brief stopover at a temple in the middle of the lake, we made our way to a small Tay minority village to walk through their toiled farmlands. Related to the Shan people of Myanmar, you can interestingly find pockets of agricultural towns with small Tay populations throughout Vietnam. A lady works the fields in one of the Tay villages on the edge of Ba Be Lake. Following our fascinating look into farming life, we moved onto the impressive Puong Cave. After exploring the incredible caverns in Phong Nha, we have high standards when it comes to limestone chambers. However Puong Cave proved to be quite enchanting. Home to over 18’000 bats and featuring imposing columns, stalagmites and stalactites, Puong Cave was majestically compelling. The time finally came to start our trek. With Mr Linh’s 6 year old son, Leng, accompanying us, we began our ascent into the mountains. In short time we were rewarded with unobstructed vistas over Ba Be Lake and the striking peaks in the distance. READ MORE – Check out our guide to the best things to do in Hanoi. The awe-inspiring view over Ba Be National Park. Our first day hiking took us 10km through the national park, where we had to traverse through tiny scatterings of timber-built houses and rice terraces. Young children froze as we approached, slightly shocked to see a couple of disheveled Westerners treading on their properties. Quick introductions and smiles easily dispersed the trepidation as we exchanged high 5’s with the kids. A young child in one of the villages we walked through. He seemed quite unsure of us to start with, then gradually warmed up to our presence. It took only a few hours to reach our first night’s homestay – the abode of Hung and Loan. Also members of Mr Linh’s family, they ushered us inside and sat us around the open fire. Happily they provided some much appreciated hydration in the form of fresh green tea. Loan diligently set about preparing our dinner with the help of Hung and his father, while Lesh and I relaxed and got to know all of our affable hosts. To call our meal a feast would be a great understatement. Dish after delectable dish was put on the table and served in communal fashion. We joined the whole family (and some of their friends and neighbours) as we gorged ourselves on fresh chicken, pork, vegetables and rice. Each serving was laced with abundant flavours, spiced with herbs from the family’s garden. There was no possibility of going hungry as there seemed to be an endless supply of each course. A H’Mong lady cooking our lunch on the first day. The green tea slowly diminished, however, as we all tucked into a bottle of corn wine; a strong home-brew that is drank in honouring of life, love, new friends, any day ending in ‘Y’, or any other cause for celebration. Almost every few minutes we were tapping our glasses together and downing another shot of the liquor. With our stomachs full, and our minds becoming more than a little hazy, we finally retired to bed at the respectable time of 9pm. Awoken by daylight streaming through the cracks in the slatted walls, we rose out of our comfortable bed and went for a short walk around the property. We soaked up the tranquil ambiance of life high up in Ba Be National Park before we were called over for traditional Vietnamese breakfast of pho ga – chicken noodle soup. We slurped up every last delicious drop as we sat on a stone table, overlooking the family’s rice terraces. Breakfast with a lovely view. Sadly we said goodbye to our host family as we started off on the second and final day of our trek. With 20km to go before we reached Mr Linh’s Homestay, we knew we’d be in for a tiring expedition. Luckily the captivating scenery quelled any doubts we had of our fitness levels as we were constantly distracted by rolling hills, more terraced fields and blue skies. With only a quick stop for lunch on the steps of a local school, we made it back to the Mr Linh’s Homestay in good time. Lesh and I were forced to power on, less we be upstaged by the 6 year old trooper, Leng, who managed to trek just about every metre of the 30km journey alongside us. Taking a quick break with incredible views. What we thought would take all day only ended up being about 6 hours. We arrived in Bo Lu village mid-afternoon, and I immediately tried my hardest to consume every cold beer Mr Linh had in his fridge. It didn’t take long before the enormity of the last two days came over us and we all passed out for a brief afternoon siesta. Trekking in Ba Be National Park was the perfect ending to our 1500km Northern Vietnam motorcycle adventure. We thought we needed a break from constantly being on the move, but Mr Linh proved to us that we just needed to be surrounded by unspoilt environments to completely refresh our souls. Why we had never thought of that previously, I am unsure. But we sure are glad that we decided to stay at Mr Linh’s Homestay, and that we were reminded that immersing ourselves pristine nature is the best form of rest and recuperation. Jazza trekking his way around Ba Be National Park. We did this tour with the support of Mr Linh’s Homestay. All thoughts and opinions are our own. We are currently on our way towards Vietnam (still in China at the moment), and Ba Be caught our eye because we love our trekking. We were only slightly put off by the fact that there seems to be no information for ‘independent’ walking and touring in the area, and the homestay’s tours are not exactly cheap. Do you think that a trip to the area without a tour is manageable? Or has everything been set up around Mr. Linh’s tour company? Hi Lisa. There isn’t too much information on independent trekking in the area, although it may be possible. Mr Linh does hold a great trekking tour, but perhaps you can call and ask around for more info if you would rather do it on your own. Happy travels. We are due to arrive at Ba Be Lake in the next couple of days and we too were hoping to do some independent trekking. Did you manage to find any info/do an independent tour in the end? Hi Rosie, you could definitely find some information about the different treks in the area. There are many guesthouses there who can help you. We went on a guided trek but you could have easily done it independently. All the best. Really enjoyed reading your post! Looks like an incredible adventure and Ba Be National Park looks stunningly beautiful. Hopefully, I’ll be heading to Vietnam this year and will add this to the bucket list. Cheers John! Ba Be National Park really is spectacular. Hope you get a chance to visit it when you come out. Happy travels! I love your stories! Ba Be looks like an amazing part of Vietnam. Thanks for sharing!